by Bob Fairey, AVX. Solid tantalum capacitors are among the most popular types of small, surface-mount capacitors for electronic applications across the consumer, automotive, aerospace, and medical device markets. This paper will provide some context on the development of tantalum capacitor technology and address issues frequently faced by users, including the need for low equivalent series resistance (ESR) in filtering applications and the need for the highest possible reliability and long-lifetime performance in aerospace and medical applications. The history of solid tantalum capacitors started in the 1950s when the concept was invented by Bell Labs to provide small capacitors to accompany their transistors. 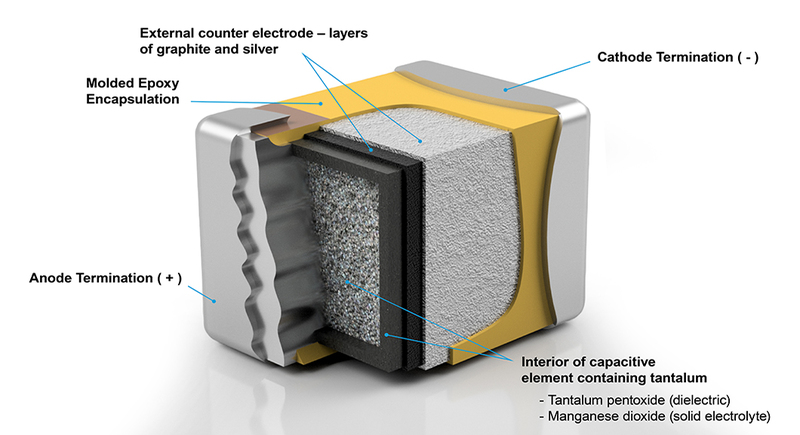 The structure of a tantalum capacitor is sponge-like, with a very high surface area available for dielectric formation. This provides high capacitance in a much smaller package than other capacitor technologies. 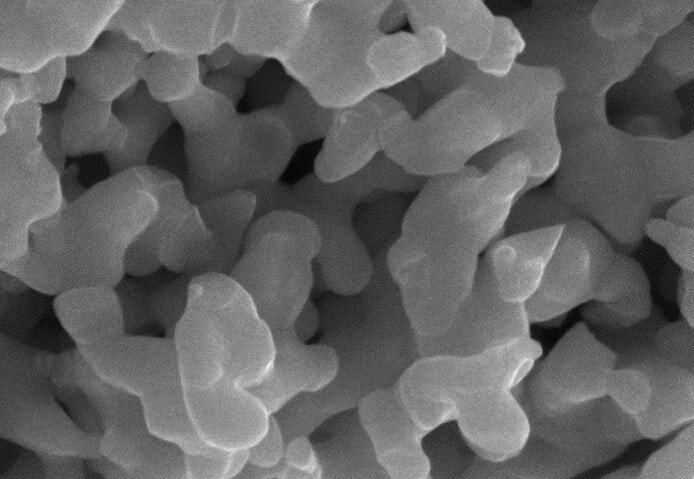 Figure 1: A magnified view of the sponge-like microscopic structure of tantalum capacitors. Figure 2: The dielectric surface area of a tantalum capacitor anode compared to its finished size. Over the course of the following decades, tantalum capacitor technology evolved to include several form factors. Axial- and radial-leaded configurations that are compatible with automated insertion processes for through-hole technology dominated until the 1980s. At that time, assembly technology evolved to embrace surface-mount technology (SMT) and SMT tantalum capacitors of various sizes were developed and widely adopted. The widespread employment of surface-mount technology exposed tantalum capacitors to conditions outside of those experienced by their axial- and radial-leaded counterparts. High-temperature, board-level reflow processes can initiate defects in the thin-film dielectric layers of tantalum components, and can occasionally lead to catastrophic failure and even ignition. As a result of this experience, tantalum capacitor manufacturers adopted in-line reflow conditioning and other measures to help the capacitors survive mounting and reflow conditions. 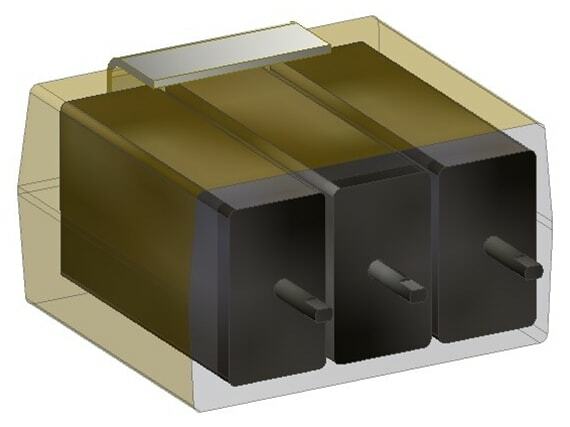 These efforts have been successful at mitigating the risk of catastrophic failures, enabling solid tantalum capacitors to provide reliability that is suitable for any application. Demand for tantalum capacitors grew dramatically with the development of reliable SMT versions in the late 1980s and continued into the 1990s. Surface-mount solid tantalums were the smallest capacitors in the 1–100μF range, and became the industry standard for many applications. The introduction of cellular phones and personal computers, along with the incorporation of extensive electronic equipment in automobiles, were the primary market drivers of this growth. Solid tantalum capacitors are electrolytic capacitors, and all electrolytic capacitors are polar, meaning that current will only pass from the positive end (the anode) to the negative end (the cathode). The three major elements of an electrolytic capacitor are the anode, dielectric, and cathode. The tantalum anode consists of particles of very pure tantalum powder that are pressed and sintered into a sponge-like structure. Traditional versions have a tantalum wire embedded within the structure to create the positive connection to the circuit. The surface of the anode is covered with a layer of tantalum pentoxide (Ta2O5), which functions as the capacitor dielectric. In traditional solid tantalum capacitors, the cathode is manganese dioxide (MnO2). This material is deposited over the dielectric, followed by other materials — typically carbon and silver — to establish a connection with the other capacitor components. Figure 3: Construction detail of a traditional surface mount tantalum capacitor. The MnO2 cathode has a property that significantly contributes to tantalum capacitor reliability. Defects in the Ta2O5 dielectric cause local heating at the defect site during capacitor operation, which changes the nearby MnO2 to Mn2O5 — a non-conductive phase of manganese oxide. This non-conductive site serves to remove that portion of the capacitor from the circuit, effectively correcting the defect. This characteristic is called self-healing, and it allows tantalum capacitors with MnO2 cathodes to have a declining failure rate over time. 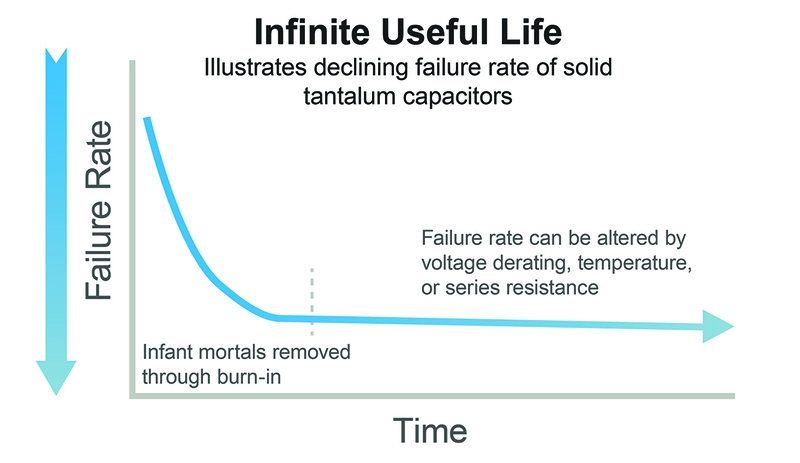 Throughout their history, tantalum capacitor manufacturers have performed preconditioning (i.e., burn-in) through exposure to elevated voltage and temperature intended to facilitate this self-healing characteristic and remove weaker parts from the population. For more information about the construction of solid tantalum capacitors, please refer to “Basic Tantalum Capacitor Technology” by John Gill. Most surface-mount tantalum capacitors are constructed as shown above, but there are also versions that use a conformal epoxy coat as the outside surface. These can be somewhat smaller than molded capacitors, but at the cost of reduced mechanical strength. To optimize use of available board space, AVX developed and patented the TACmicrochip® construction in 1995. This construction has a tantalum wafer substrate with tantalum powder pressed and sintered onto the surface. Individual anodes are defined on the surface using a sawing operation, and the wafers are processed through dielectric formation and cathode deposition. Next, a lid is placed over the structure and epoxy is flowed into the channels between anodes. This is followed by a dicing operation that separates the capacitors, which then proceed through burn-in, test, and packaging processes. The TACmicrochip and its high-reliability counterpart, the COTS-Plus TBC Series microchip, have become very popular in applications where space is at a premium, including handheld electronics and implantable medical devices. Figure 4: Construction detail of the AVX TBC Microchip. The inherent equivalent series resistance (ESR) of tantalum capacitors is higher than some competing technologies. AVX and other manufacturers in the industry have done much to address this issue. Figure 5: The interior view of a TBM Series multianode tantalum capacitor. Solid tantalum capacitors are frequently used in power supply filtering applications, which exhibit improved efficiency with lower capacitor resistance. To address the needs of these types of applications, AVX introduced the first molded, low-ESR, surface-mount tantalum capacitors — the TPS Series — in 1992. This series proved to be extremely popular and helped expand the market for tantalum capacitors. For instance, AVX and others soon incorporated surge testing into their production sequences to address concerns with power-on failures. Over the years, other product enhancements have also been introduced, including multianode tantalum capacitors (like the COTS-Plus TBM Series) for even lower ESR. More recently, tantalum capacitors with conductive polymer counter-electrodes in place of the traditional MnO2 cathode system have become popular in consumer electronics and automotive applications, since polymer materials have a lower resistance than MnO2. However, there can be tradeoffs between providing low ESR and high reliability in solid tantalum capacitors. The stated reliability of conductive polymer capacitors is poorer than that of MnO2 based systems because the polymer materials lack the self-healing properties of MnO2 systems. This also causes the leakage of the polymer capacitors to be significantly higher than MnO2-cathode capacitors. In demanding applications where low ESR and very long product life is critical, such as satellite electronics, low-ESR MnO2-cathode capacitors are still the preferred choice. AVX developed the space-level SRC9000 TBM Series multianode capacitors, which utilize proven MnO2 cathode technology to achieve the lowest possible ESR and incorporate the latest processing and testing techniques, Weibull burn-in and statistical screening for DC leakage, to remove any outliers from the population. This methodology ensures that the low ESR required for aerospace circuits is maintained over the long lifetime required for space platforms and has been successful in meeting the demanding needs of the aerospace industry. Capacitors produced in this way have been incorporated in most US space systems, including the Mars Curiosity Rover. For more technical information about ESR, please reference “Equivalent Series Resistance of Tantalum Capacitors” by R.W. Franklin. The most common commercial applications, such as cell phones, are easily recharged. So, capacitor leakage is not a major issue in these applications, and only becomes a problem if the capacitor fails catastrophically. 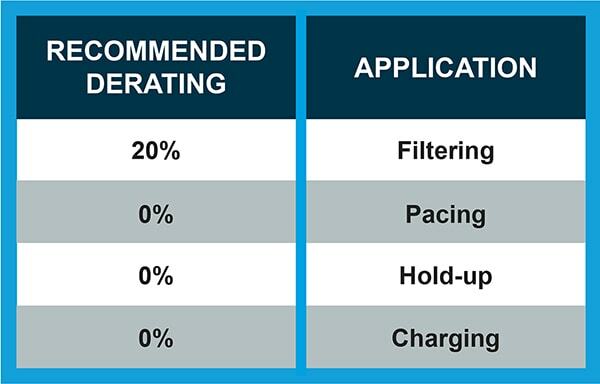 However, in critical, implantable medical device applications, which are not as readily recharged as consumer applications, capacitor leakage is a real detriment to battery life. If a capacitor has high leakage resulting from dielectric defects, high-temperature reflow processes can aggravate the defects and significantly increase the capacitor’s leakage. There are several factors that contribute to capacitor leakage, but the most important is the thickness of the dielectric. Tantalum pentoxide (Ta2O5) has a dielectric constant that is lower than other capacitor types, but it can be grown as a film over the surface of tantalum metal. This significantly contributes to the small size of tantalum capacitors, as it allows a very thin film to create a functioning dielectric layer. The Ta2O5 dielectric is created by passing current through the sintered tantalum anode in the presence of a liquid electrolyte. This process builds a layer over the surface of the tantalum particles, taking tantalum from the anode and oxygen from the electrolyte to form Ta2O5. The voltage applied during formation will determine the thickness of the dielectric layer. Thicker dielectrics have higher voltage handling capabilities and will have lower DCL at a given applied voltage than thinner dielectrics. In the capacitor industry, the dielectric thickness is usually expressed as the formation ratio compared to voltage. For example, a formation ratio of 3 would mean that the dielectric is formed at 30V for a 10V capacitor. For high-reliability capacitors, AVX typically specifies a formation ratio of at least 3 to provide optimal reliability and low leakage. It is not unusual for commercial capacitors to have much lower formation ratios. Some electrolytic capacitors depend on a wet electrolyte, or on a level of moisture content in the cathode system, but these can dry out over time and lead to capacitor failure. The long-term reliability of these capacitor types can be illustrated with the familiar bathtub curve, which shows an eventual increase in failure rate as the cathode system degrades. Tantalum capacitors with conductive polymer cathodes and aluminum capacitors with wet electrolytic systems exhibit this wear out mechanism. 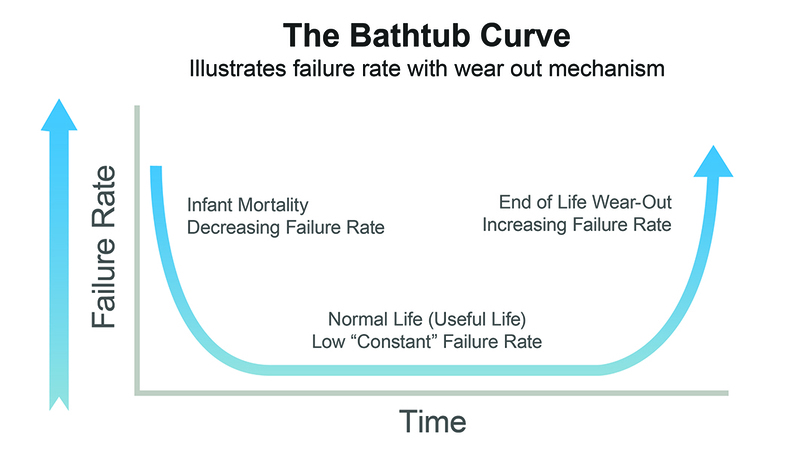 Figure 6: The “Bathtub Curve” illustrates the reliability of a component with a wear out mechanism. Unlike those technologies, solid tantalum capacitors with MnO2 cathodes have no wear-out mechanism. The cathode is a solid system that is not subject to degradation over time, and the self-healing mechanism exhibited by this technology ensures that small dielectric defects do not lead to catastrophic failure in normal operation. The result of these factors is a failure rate that improves over time, and is a major reason that MnO2-based tantalum capacitors are popular in aerospace and medical life-support applications. Figure 7: Solid tantalum capacitors with MnO2 cathodes have no wear out mechanism and improving reliability over time. Although tantalum capacitor manufacturing processes have significantly improved over time, a small number of weaker parts can exist in any production batch. As mentioned, preconditioning (i.e., burn-in) methods are used to identify and remove these infant mortals from the population. The type of burn-in varies depending on intended applications, but normally includes high temperatures and/or voltages above the capacitors’ ratings. For commercial capacitors, the burn-in time is typically short to minimize cycle time and cost. The traditional method of burn-in for high-reliability tantalum capacitors is known as Weibull burn-in due to the statistical method used to calculate reliability. These test conditions are highly accelerated (e.g., 85°C and a multiplier of rated voltage) and failures are counted over time. Using the Weibull distribution as the assumed model of batch behavior, the calculated reliability must reach a predetermined level and the failure rate must be declining. This system has been used for many decades to characterize high-reliability capacitors, and is used to state reliability as a maximum failure percentage per thousand hours of operation at rated voltage with a 90% confidence level. The reliability level of commercial capacitors is normally projected at 1% per thousand hours, while high-reliability capacitors typically offer reliability ranging from 0.1% to 0.001% per thousand hours with 90% confidence. However, it is important to note that the actual reliability exhibited within intended applications is much better than projected by burn-in methods, and is typically expressed in very low failures-in-time (FIT) rates. Reaching such high reliability levels requires that infant mortals are identified and removed from the population in the early stages of burn-in, as, after that, the failure rate declines sharply. Tantalum capacitors that are reliability graded through Weibull burn-in are successfully employed in the most demanding applications in the electronics industry, including satellites and implantable medical devices. After many years of supplying high-reliability tantalum capacitors to the medical device industry using Weibull burn-in for reliability grading, AVX explored other potential options. The primary reason for this shift was that, as our production processes improved, it became more difficult to create the infant mortals required for Weibull grading. Voltage acceleration factors had to be increased to generate failures, but that caused issues with capacitors’ electrical parameters. 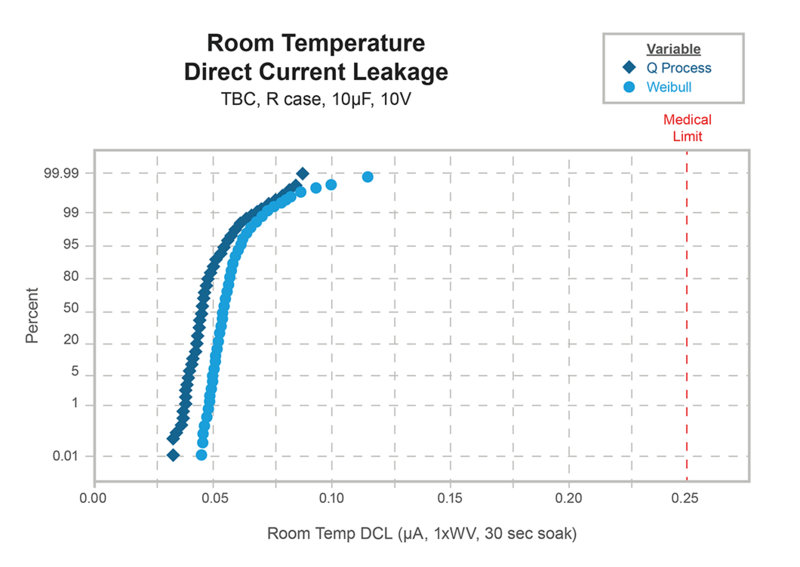 Since most customers in the medical device industry use 125°C system-level burn-in, we explored using capacitor-level burn-in at that condition with lower voltage acceleration and discovered that 125°C burn-in at near-rated-voltage, in conjunction with statistical screening for other parameters, is as effective as Weibull at removing infant mortals, but produces a lower DCL distribution than Weibull. This led to the development of our patented Q-Process™. For detailed information about the Q-Process, please refer to “Reaching the Highest Reliability for Tantalum Capacitors” by James Bates, Marc Beaulieu, Michael Miller, and Joseph Paulus. Additionally, the traditional derating rules for solid tantalum capacitors — that capacitors be used at 50% of their rated voltage to achieve optimal reliability — do not have to be applied to Q-Process capacitors. Capacitors produced with the Q-Process can be operated at full rated voltage, which allows for the selection of smaller capacitors with lower rated voltages, in most applications. Figure 8: AVX Q-Process reduces or eliminates the need for voltage derating. Designers of military and aerospace systems were among the early adopters of solid tantalum capacitor technology. Wet tantalum capacitors have been used in military and aerospace applications with high capacitance and/or high voltage demands for many years, and now solid tantalum capacitors are able to meet a significant portion of these application demands as well, and with the added advantage of being much smaller and lighter components. Various military specifications were developed by the Defense Supply Center, Columbus (DSCC), which is now the Defense Logistics Agency (DLA), to provide an enhanced level of reliability for these applications. For surface-mount tantalum capacitors, the relevant specification is MIL-PRF-55365. AVX’s MIL-PRF-55365 CWR09 Series capacitors are among the most popular SMT tantalum capacitors employed in military applications. Over time, this specification has been enhanced by the addition of several new series, including: the extended-range CWR19 Series, the low-ESR CWR29 Series, the MIL-PRF-55365/8 EIA case size CWR11 Series, and the MIL-PRF-55365/12 microchip CWR15 Series. In the 1990s, the Pentagon issued an initiative encouraging the use of commercial off-the-shelf (COTS) products in military and aerospace systems with the expectation that employing a wider range of lower cost components could offer many benefits. However, while it became evident that some systems could safely employ commercial capacitors, it also became clear that designers needed to exercise caution when specifying COTS capacitors in order to maintain the high levels of system reliability required by military and aerospace applications. In support of this initiative, AVX introduced the COTS-Plus range of tantalum capacitors, which offers conservatively designed commercial capacitors subjected to military-type testing to provide improved reliability solutions at lower costs. This range now consists of several series, including the TAZ Series, the TBJ Series, the multianode TBM Series, the TBC Microchip Series, and more, and provides designers with a much wider range of case sizes, ESR capabilities, and improved volumetric efficiencies compared to MIL-PRF-55365 product lines. For more detailed information about COTS-Plus and SCR9000, please refer to “Advanced Test Methods for Up-screened Tantalum Capacitors” by Brian Brunette. More recently, to address the need for a common space-level specification, AVX encouraged the DLA to introduce a new section of 55365 with testing designed to ensure space-level reliability. Series that employ such testing, including AVX’s CWR T-level Series and SRC9000 space-level series, have allowed aerospace designers to select from a proven range of components without having to generate a unique source control drawing. Figure 9 lists and compares our various military and aerospace tantalum capacitor offerings and the many options available with each. 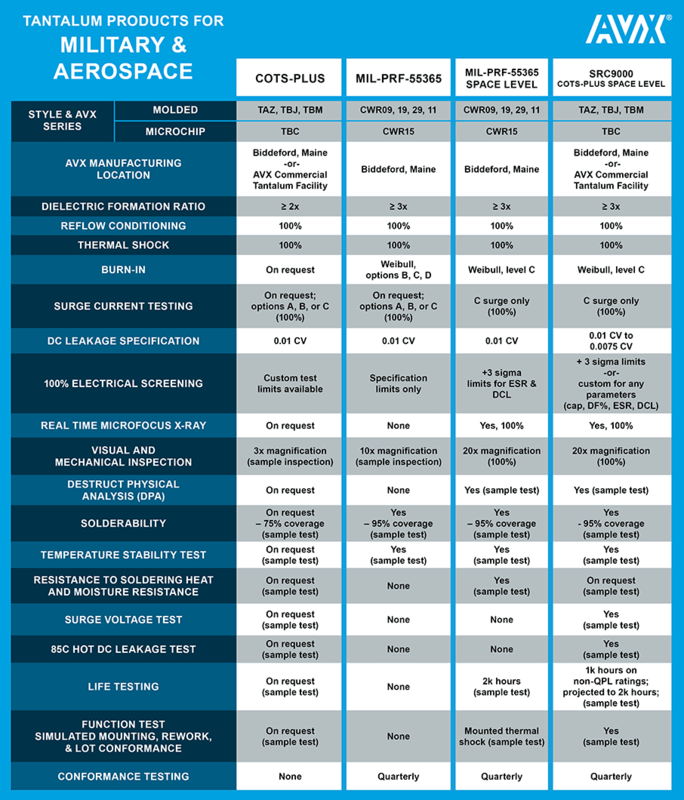 Figure 9: Design and testing comparison of AVX military and aerospace tantalum capacitor specifications. Solid tantalum capacitors are used in most medical electronic applications, ranging from diagnostic equipment to heart monitors and including implantable life-support devices, like pacemakers and defibrillators, and are preferred over alternative capacitor technologies in space-constrained applications, such as implantable devices. Due to the wide variety of potential applications for these components and the varying nature of some of them, we have developed a product structure designed to facilitate easy and effective capacitor selection for medical applications. 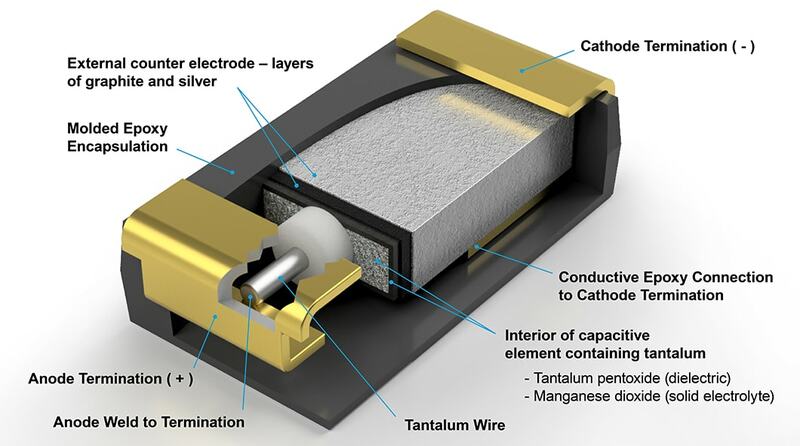 We define critical applications as implantable/life-support (e.g., pacemakers, defibrillators, cardiac resynchronization therapy) and implantable applications in which tantalum capacitor leakage can be a determinant of battery life (e.g., neuromodulation devices). Since battery life can be shortened by excessive capacitor leakage, and because surgery would be required to address early battery depletion, we consider any implantable application that is intended for long-life operation to be critical, and have developed a range of conservatively designed and specially tested components for these applications, including the HRC5000 TAZ Series, the HRC5000 TBC Microchip Series, the TCP Series low-ESR modules, and the HRC6000 TBC Microchip Series. For non-critical applications, including external electronics for life-support equipment (e.g., vascular assist devices), temporary implantable monitors, and external insulin pumps, we have developed several capacitor series that include change control and statistical screening with relatively conservative design rules, including the T4J Series, the T4C Microchip Series, and the HRC4000 T4Z Series. Compliance with FDA change control requirements is not available on standard commercial components, so this voluntary compliance is a significant selling point for our non-critical range. 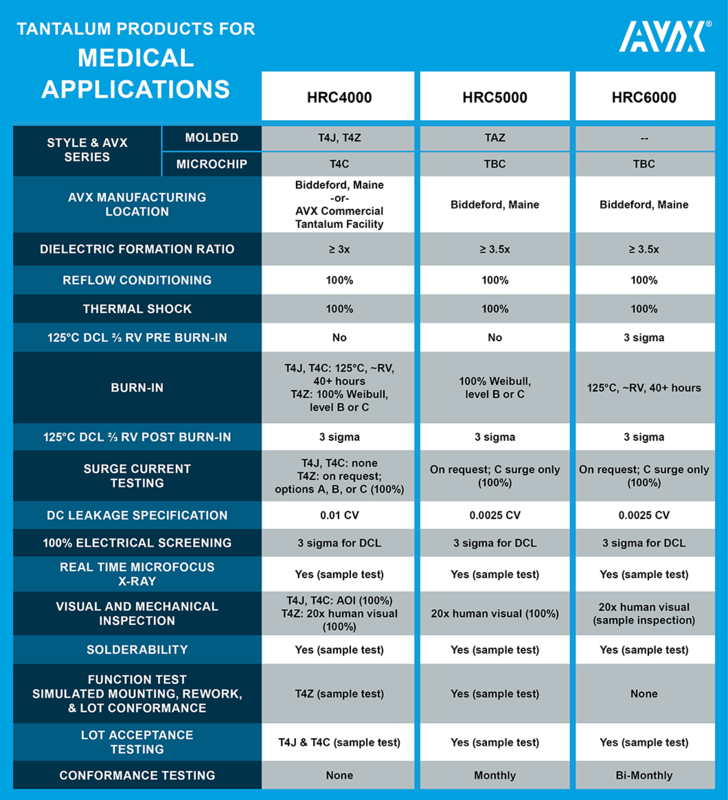 Figure 10: Design and testing comparison of AVX medical grade tantalum capacitor specifications. AVX’s efforts to minimize DCL for the broad array of both critical and non-critical medical applications, which include: conservative design rules, improved process control at critical manufacturing steps, maverick lot detection, statistical screening to 3-Sigma limits to remove non-normal parts from the distribution, and leakage testing at multiple temperatures, have resulted in 75% or greater lower established specification limits. These measures, along with the dry packaging of components, have been demonstrated to virtually eliminate the risk of reflow-induced DCL increases, making tantalum capacitors a safe choice for even the most critical life-sustaining medical applications. AVX’s range of capacitors for critical medical applications also have restrictions regarding changes in materials, manufacturing, and testing in order to comply with FDA requirements for effective change control. Figure 11 shows the actual distribution of DCL across hundreds of manufacturing lots compared to the common commercial specification limit of 1.0µA and a typical medical customer specification limit of 0.250µA. Figure 11: DC Leakage distribution of AVX 10uf/10 volt medical grade capacitors in blue. AVX’s patented Q-Process incorporates all of these techniques to produce medical capacitors with the lowest DCL in the industry. Our tantalum capacitors for critical medical applications are extensively employed in implantable pacemakers, defibrillators, neurostimulators, and have directly contributed to longer battery lives and improved reliability in these and other medical devices. Figure 12: Probability curves illustrating DC Leakage improvement for AVX Q Process vs. Weibull testing. AVX has recently expanded its range of medical-grade tantalum capacitors to include three new products developed specifically for non-critical applications. Non-critical medical applications are those that, while not implantable, life-sustaining devices, still stand to benefit from product and process change control, lower DC leakage, and improved system reliability. AVX’s HRC4000 product family utilizes the latest advances in tantalum powder technology to achieve extended capacitance ranges and smaller package sizes. The tantalum powder used to create capacitors comes in various particle sizes. Larger particles can provide thicker dielectric layers and higher voltage carrying capabilities or lower DCL, while smaller particles can be used to make smaller capacitors, but are limited to lower voltage ratings. Although these new products may have somewhat higher DCL than the capacitors designated for critical medical applications, they incorporate a more economical subset of the same rigorous Q-Process testing and control techniques that removes outliers from the production population and have strict controls over material or process changes to ensure high-reliability, long lifetime performance. Figure 13: AVX T4 range of tantalum capacitors for non-critical applications. Solid tantalum capacitors offer infinitely useful lifetimes and unparalleled volumetric efficiency, making them a smart choice for high-reliability applications including military, aerospace, and medical devices. Improved manufacturing and testing technologies have enabled the successful employment of low-ESR MnO2 tantalum capacitors in aerospace platforms, and dramatic improvements in capacitor efficiency and reliability, in addition to the incorporation of FDA-compliant change controls, have been introduced over the last 10 years to expand the application of this technology across a broad range of both critical and non-critical medical applications.